Motor Marc’s new painting is expressed through vibrant colors and the glimmer of real diamonds which epitomizes the true essence of what Dubai has to offer. 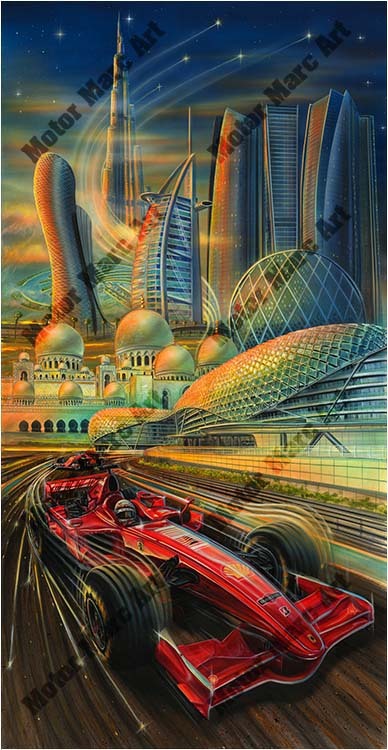 The original artwork to be unveiled at this event is an elaborate landscape using themes of objectivity vs fantasy to express the relationships between science, architecture and lifestyles within the environment of Formula 1 racing and the beautiful city of Abu Dhabi. Since this art was created especially for this show, there will only be ten signed limited edition canvas prints available to purchase as well as the original painting. What a great Motor Marc collectible to own.